A creative and interactive new program that encourages play based learning as children have fun and reinforce essential preschool skills. Our first topic will be “In the Jungle” join us for our 45 minute sessions and build your favourite jungle animals as we journey through the alphabet and learn about these amazing creatures. Explorers will discover colours, shapes, patterns, Letterland and counting. We end with a story of the day allowing the children to interact with their LEGO® DUPLO® model. 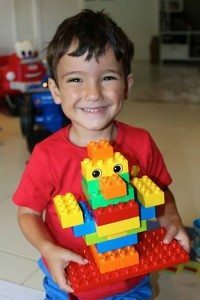 Reinforce essential preschool skills with a fun, new approach based on the time-tested popularity of LEGO®bricks! Introduce your preschoolers to the fun of learning, building and playing the BRICKS 4 KIDZ® way!